I can’t remember exactly how old I was when I got my first library card; I think I may have been nine. But I do remember where I got my library card. 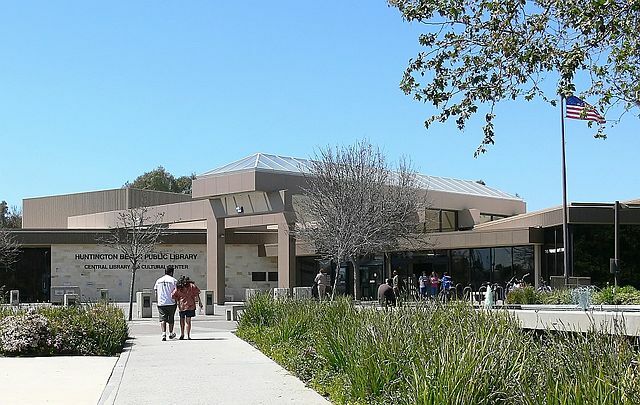 It was at the beautiful and magnificent Huntington Beach Public Library (HBPL). The HBPL is located in a 350-acre park and is several stories high (and low with sublevels) with a theater, indoor fountains, a spiral staircase, quiet study rooms, a big bank of computers, a gift shop and more. It is HUGE. And apparently has only become more huge since I was there in the 1970s and 1980s. In the mid-1990s, the library underwent a 43,000-square-foot expansion. Whenever I think back on my childhood, one of the things I am most grateful for is that I lived close enough to walk to this amazing library. I love the way a library smells. The smell of old paper is very comforting to me. I love seeing so many books in one place. The possibilities of what you can learn! It’s mind-blowing. I like touching books. I remember as a kid I would walk through the many, many aisles and I would trail my fingertips on the spines of the books as I scampered by. I truly believe that one of the main reasons that I am good at reading and writing is because I spent so many hours at the library. I was there practically every week from age nine to eighteen. It was a quiet refuge away from my critical, bickering parents. I read there. I watched movies there. I volunteered there. I even got kicked out for talking too loud while studying with my friends. I had many, many good times there. Thank God for public libraries. I googled where libraries come from and found one of the better explanations at The Straight Dope. Turns out that in the old days, rich people had social libraries; bookstores and printers had circulating libraries; and schools had school libraries. In 1833, the town library of Peterborough, New Hampshire, combined these three principles to create the U.S.’s first public library. Hats off to Peterborough! Next time you need a break, go to the library. You can use a computer. Read a book. Browse the magazines. Listen to an author give a reading. Watch a preview of a play or opera or musical. Watch a video. Take a workshop. Got a question or a dilemma? Talk to a librarian–some of the most amazingly resourceful people in the world–and I will bet that they can help you find an answer or solution. Or try my better-than-retail-therapy-way-to-beat-the-doldrums-or-the-blues: go to the library and pick a book at random. EXPLORE AT RANDOM until you find a book that calls to you. Then check out that book and take it home to read. I guarantee you will feel better. * Some of you are going to say, the library is not free, it’s funded by our tax dollars. This is true. All of us who pay our taxes help to sustain public libraries. Because of taxes, libraries remain free to anyone whether you are poor or rich or somewhere in-between. That is pretty amazing. This entry was posted in Favorite Free Things by Peg. Bookmark the permalink. Peg – what a great post! I didn’t know this about you. I love your take on libraries and the HBPL sounds outrageous. My sweetheart, Matt, is a big library fan and I love seeing him come home with a big stack of lord-knows-what. I seem to be an expert at collecting library FINES … and losing books … and videos … so I’m a library lover lurker for now and aspiring library loving patron. Ha ha! Well, since Matt is a library regular, maybe he can help you with returning your stuff on time? 🙂 I’m so glad you liked the post. Thanks so much for reading my blog and for letting me know what you think of it. I always appreciate your comments. I was just at HBPL last night. I LOVE the library! I love the loooong fountain outside; so pretty in an industrial-simple, concrete sort of way. I like to pick books at random most of the time, too. The joy of discovery! When I come out of the library, the sun has set and the jasmine scents the air. You just can’t get that kind of experience going online and reading. So glad to hear you love the HBPL too, Rose! That place holds a lot of great memories for me.